Fairy Tale Fandom: The Stuff of Legends: Johnny Appleseed. The Stuff of Legends: Johnny Appleseed. That’s right, it’s apples. And all the various uses and forms of them (apple pie, applesauce, apple cider, pork with apples, waldorf salad, the list goes on and on). They’re such a big deal, that going out to orchards and picking them yourself is something of a tradition around here. Now, here in the USA, the state that grows the most apples is Washington. The second biggest apple grower is right here in New York State. However, the most famous person to ever become associated with growing apples is originally from Massachusetts but did much of the work that would make him legendary in Ohio and Indiana. 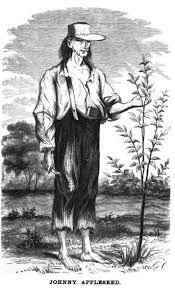 Of course, I’m talking about John Chapman, also known as Johnny Appleseed. 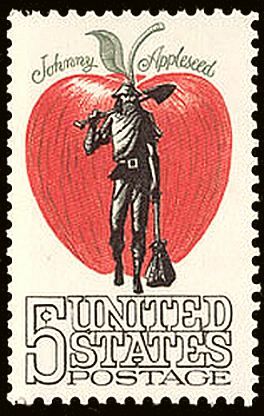 Johnny Appleseed is one of the great legendary characters people talk about when they talk about the American frontier. He’s mentioned in the same breath as Davey Crockett, John Henry, Pecos Bill and Paul Bunyan. However, unlike Pecos Bill and Paul Bunyan who were inventions of active imaginations, we know that John Chapman was a real person. How famous is Johnny Appleseed? Well, famous enough that this picture appears on the wall of an apple orchard store in New York State, a fair distance from his adopted home of Ohio. From mural at Riverview Orchards in Rexford, New York. Before we go any further, let’s have a look at the way most people in the US and probably the world learned about Johnny Appleseed: the Disney cartoon. That’s right, folks. Long before Pocahontas, Disney played around with the story of a character who actually existed. If you click the link, you’ll get to the first part of ol’ Uncle Walt’s take on John Chapman. In the cartoon, John’s depicted as a good-hearted though scrawny nurseryman living a stone’s throw from Pittsburgh. He’s also a man of faith, as depicted in his opening song. However, he yearns to go west but doesn’t think he has it in him. At least, not until a rather unusual looking guardian angel convinces him otherwise. It’s actually not a bad little cartoon. For its time, it does a fair bit to promote the virtues of faith, brotherly love and unselfishness. Also, Johnny Appleseed is a legend after all. Legends are historical truths that take on folkloric scope and fictional aspects. The difference is that no one prefaces a movie by saying “This might not be all true, but I don’t let the truth get in the way of a good story”. The Disney cartoon does a good job of showing a nicely polished version of Johnny Appleseed, all the rough edges removed. But the thing is that real life is usually more complicated than that. Once again, to find information I turn to the local library and I find a book entitled Johnny Appleseed: The Man, the Myth, the American Story by Howard Means. Now, it seems that little is known about the real John Chapman. Seeing as he was a man with no permanent address for most of his life, that’s not surprising. We do know now that he was born in Pennsylvania and the son of a former Revolutionary War soldier named Nathaniel Chapman. We also know that in addition to his sister Elizabeth, he had a stepmother and ten half-siblings. No one’s quite sure why he decided to head west to Ohio. Perhaps he was drawn by the promise of land like so many others. Maybe he just felt crowded back in a hometown where he had eleven siblings. Whatever it was, he left for Ohio with his half-brother Nathaniel by his side (they would part ways later). If it was the draw of land, then that’s a curious draw for John Chapman. For though he bought a lot of land he never really seemed to keep any of it. As a settler, Johnny never really settled. He would buy land and start growing orchards, but he would never set up a homestead and move in. He’d just travel from place to place, growing apple trees. He dressed in rags, slept outside and went barefoot pretty much everywhere (there are a number of theories regarding Chapman’s eccentricities, one of them involving him being kicked in the head by a horse). He’d come back and check on his trees frequently, usually to see if the seedlings were big enough to sell. You see, Johnny Appleseed didn’t just grow apple trees for the sake of apple trees. He was running a business. You see, people didn’t just go out and claim land. Even on the frontier, land had to be leased or bought. One of the frequent requirements on a lease of land at the time was that the person who leases the land had to grow an orchard of fruit trees. Fruit trees took a while to grow. Growing fruit trees was usually seen as a sign that the settler was there for the long haul rather than just a land speculator. What John Chapman would do is sail down the river in a catamaran of his own design, pick through the refuse of a cider mill for apple seeds and bring them back to Ohio to plant. Then he’d sell the seedlings to settlers who needed them to start an orchard. Or, he’d give a tree away if he thought a man couldn’t pay for it (maybe not the best business model). Then whatever money he made, he generally spent on more land to plant more trees and the cycle continued. Since he slept outside and lived off the land, his business had very little overhead. The thing about the apples on most of Johnny’s trees is that most of them weren’t much good for eating. Most of the edible varieties we know now are created through grafting and John Chapman grew most of his trees straight from seeds. However, it didn’t matter much because even the small, sour apples that likely grew from those trees were fine for making hard apple cider. And since the frontier was essentially settled on a steady flow of booze, that fit most settlers’ needs nicely. If apple trees were what made John Chapman famous after his death, then his faith is what sustained him during his life. Now, it’s easy to just act like John just had some vaguely general Christian faith like the Disney short does. That couldn’t be any farther from the truth, though. John Chapman was a follower of the Church of New Jerusalem or the New Church as it’s often called. The New Church was based on the writings of a man named Emmanuel Swedenborg. Swedenborg was a scientist but also a religious mystic. He supposedly had a second sight that allowed him to see the spirit world. Swedenborg’s writings on spirituality were what you might expect from a scientific mind that had found spiritual enlightenment. He was known for giving very exact descriptions of the structure of Heaven, Hell and the spirit world. The fact that the New Church found John Chapman was actually rather amazing. Unlike a lot of other Protestant faiths at the time, the New Church didn’t draw large crowds. From town to town, they could usually count their converts on one hand. Those who joined also tended to be well-read intellectuals as well. But however John Chapman found this particular faith, it influenced his whole life. It was reflected in his attitudes towards nature and his fellow man. It was reflected in his tendencies towards pacifism and vegetarianism (Chapman tended to live off roots, nuts, berries and such that he could find. They say he never killed an animal even for food). He was known to travel from place to place tearing pages from Swedenborg’s books for people to read telling people he had “news straight fresh from Heaven”. If there were one thing that made Chapman’s life become legend more than apple trees it was the part he supposedly played during the War of 1812. Supposedly, in the city of Mansfield, there was a fear that British and Native American forces (who were allied at the time) would be moving in from Lake Erie. They began looking for a volunteer to bring a message to Captain Douglas at Mount Vernon. John volunteered. He supposedly went barefooted, bareheaded and unarmed. Essentially, according to legend, Johnny Appleseed became the Paul Revere of the frontier (Howard Means’s words, not mine). There are accounts of settlers claiming that John would run from cabin to cabin shouting warnings about what was likely going to happen at Mansfield. Some accounts say he shouted a rather simple warning while others say it was one that was oddly complex. This is one of those stories that may be more legend than truth. No one’s quite sure if he could have really made the trip in the time they said or what his warning actually was when he made it to Mount Vernon. John Chapman was a singular human being, but a human being nonetheless. This included coming complete with flaws. He had vices. Supposedly he was a habitual snuff taker. As he grew older, he would often become less patient with those who were resistant to his missionary work. Also, he was pretty much never financially solvent. When forced to take a meal at an inn, he would grouse about having to pay the bill. Also, he was in debt up to his ears when he died. The land he acquired had to be sold off to pay for it all. John Chapman met his maker in either 1845 or 1847 while staying in the cabin of man named William Worth. So, we have a picture of a complicated man. Not necessarily the frontier saint of legend. A loner, somewhat nutty religious mystic, and failed businessman in perpetual debt. However, he was also still all the things that people remembered about him. He was a man of faith, a pacifist, a vegetarian, charitable to a fault and a grower of many apple trees. I focus on Johnny Appleseed here not just because of my love of apples and folklore but as a reminder of how legends work. How they smooth out the rough edges of history and build up feats and virtues to create stories that are bigger than the men and women they are based on. There are so many legendary figures whose real roots are lost to the sands of time, that it’s nice to see a legendary figure whose existence is beyond dispute. It’s also nice to see how the legend of one unusual man can be built up to become a symbol of the power of faith, kindness and peace in a frontier fraught with violence. I’ll link you to American Folklore’s oddly short take on the Johnny Appleseed legend right HERE. And I’ll link to the Farmer’s Almanac version HERE. 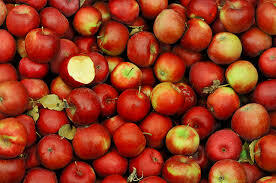 But whether you find the tales or the truth more interesting, Johnny Appleseed certainly is The Stuff of Legend! Thanks! Johnny Appleseed is one of the few legends I've tackled for my storytelling group. For the record, we're now halfway through The Stuff of Legends. It was envisioned as a 12-part series and I've already done King Arthur, John Henry, Mulan, St. George, The Pied Piper and Johnny Appleseed. 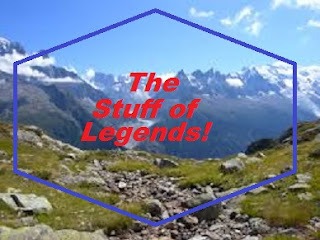 For the second half, I've got some more obscure names picked out as well as some familiar names you might not have known were legends. I'm also going to end with a post on one of the biggest legendary figures around. Fairy Tale Media Fix: Pretear. Old Tales Through a New Lens.